Today I show you a recipe in which I use an ingredient that I cannot resist. I love marzipan. Which is your favorite ingredient? Whenever it is possible I try to use marzipan paste to bake a pie with it or to create pralines. No wonder I found some marzipan paste in my kitchen cupboard. 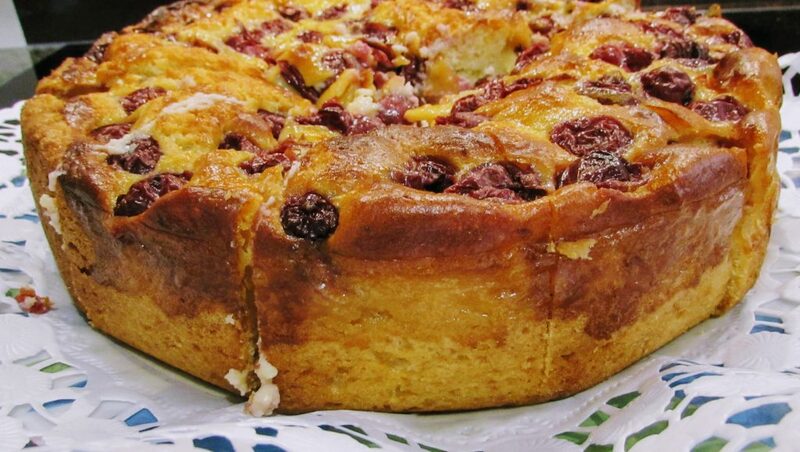 That is a good opportunity to make a homemade Cherry Pie With Marzipan. If there are no morello cherries available to you, feel free to substitute other fruits like for instance apricots, strawberries, or raspberries for morello cherries. As the homemade Cherrie Pie with Marzipan is made with a sponge mixture it is really quickly and easily done. Maybe it is good to know in advance that you should bring cold ingredients to room temperature when want to you prepare a sponge mixture. There you are that is already all you need to know about it. It is a real simple thing, isn’t it? 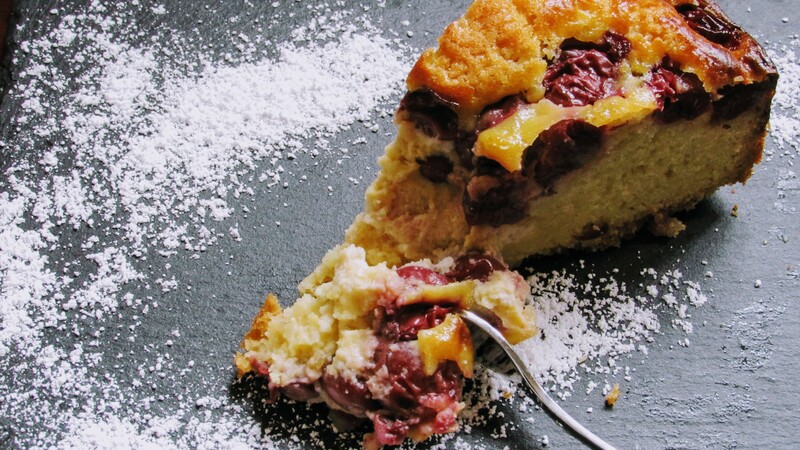 Are you curious about the homemade Cherry Pie With Marzipan? I’m already in the mood to start baking now. What about you? 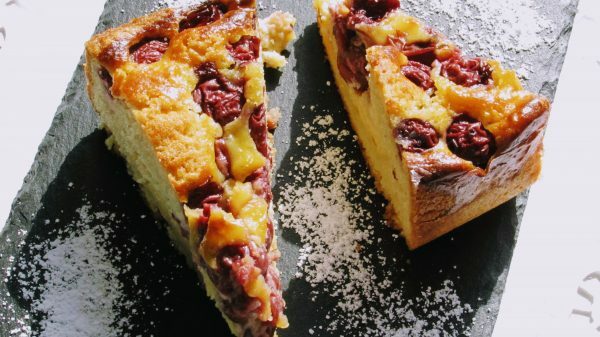 Try this delicious homemade cherry pie with marzipan and you will see how easy you can make a tasty cake. Enjoy baking it! This recipe is also available in German. Just click here. Take the butter, the eggs and the milk out of the fridge so that they reach room temperature. Preheat the oven at 160 degree circulating heat. Line the baking spring form with baking paper. 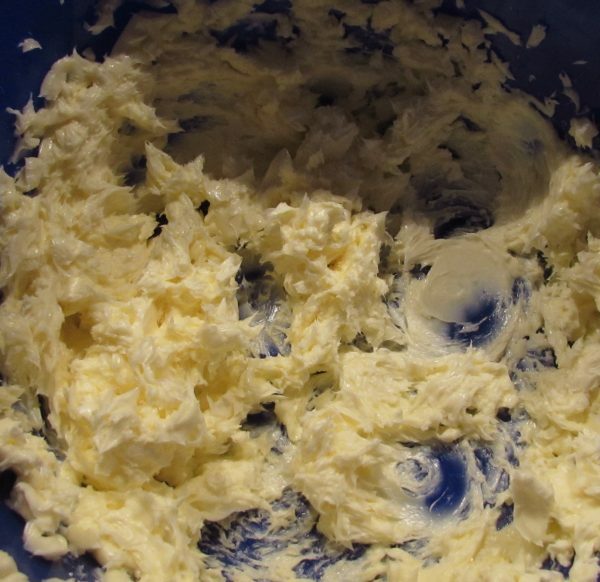 Put the butter in a large bowl and stir well until it is creamy. Add the sugar and the salt and continue to stir. Add the eggs one by one and stir until the mixture is smooth. Mix the spelt flour with the baking powder, add to mixture and continue to stir until it is smooth. Pour the dough into a baking spring form, place it on the middle rack in the preheated oven and bake the dough for ten minutes. In the meantime prepare the vanilla pudding according to the instruction given on the packing. I use vanilla pudding powder that has to be cooked. In addition to this cut the marzipan paste into small pieces or slices. When the vanilla pudding is cooked remove the cooking pot from the heat, add the almond paste slices and the eggs. Stir well. After ten minutes remove the baking spring form from the oven and let it cool down a bit before you pour the mixture of vanilla pudding, almond paste and eggs on the dough. Spread the highly drained morello cherries over the mixture of vanilla pudding, almond paste and eggs. 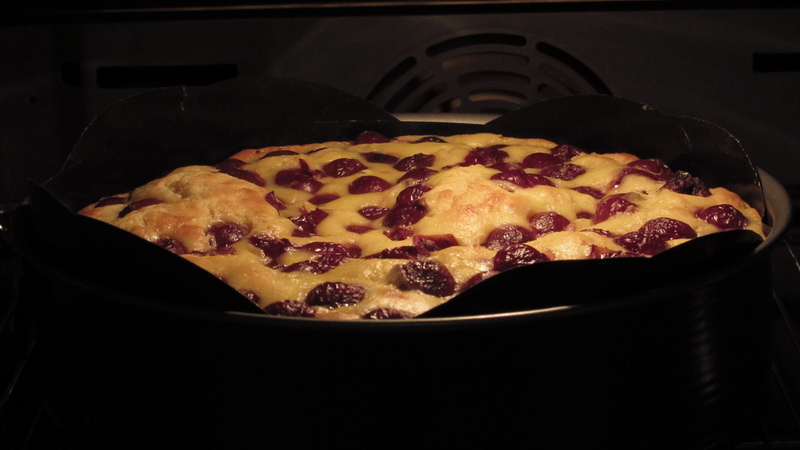 Finally place the baking spring form on the middle rack in the preheated oven and bake the dough for another 50 minutes.